Who has tons of time to make a good lunch or dinner? I’m thinking not many hands were raised – and I’m right there with ya! Life’s too busy to spend forever cooking, but we still want to give our families delicious, healthier options. Luckily, this yummy simple-to-make BBQ Chicken Pasta just became even easier with the Calphalon Self-Sharpening Knife Set! As far as prep goes, the time that could be cut the most was chopping the produce and meat – and to make that go faster, while still being safe, is with sharpened, quality knives. And when you’re already looking to ‘cut’ down on time, it helps that they’re self-sharpening, with ceramic sharpeners built into the storage block (in the stainless steel spot). Calphalon even shares plenty of Knife Skills on their site – to keep your skills as sharp as their knife set! Bake chicken, marinated in half the BBQ sauce, at 375 for about an hour (or until chicken is cooked through). Cook pasta according to package directions. Dice the green onions and chicken breasts – add to pasta. Include the remaining BBQ sauce and mix it all together. Plate and top with shredded cheese. See, told you it was super easy! I like to whip up a bunch and freeze the extras, so we can grab a meal when we’re super stressed for time. I’ve already been through several of these videos and know they’re gonna help me plenty in the kitchen! You can check out the 3 Models they offer on their site. Plus enter below for a chance to WIN YOUR OWN KNIFE SET!!! 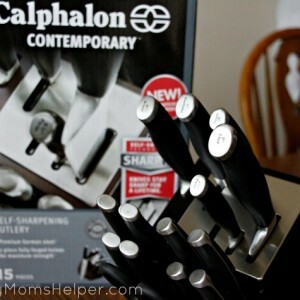 Who wants to win a Calphalon Self-Sharpening Knife Set of their own?! Here’s your chance! I’ve been craving BBQ lately. Not sure why; perhaps it’s my refusal to accept that summer’s almost over. Or maybe I’ve just been needing some tangy deliciousness. 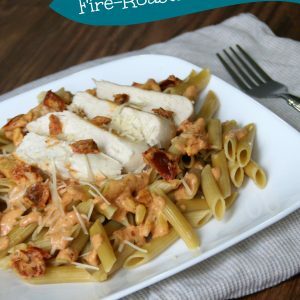 Regardless the reason, yesterday I finally gave in and tweaked our planned meal into this amazing BBQ Chicken Pasta! 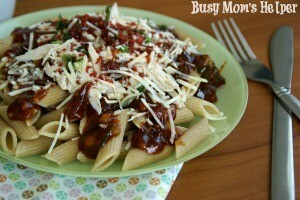 We’re definite pasta-lovers in our house, especially penne pasta, and adding my Tangy BBQ Sauce just completed our dish perfectly! For some healthy protein I included some chicken, then you just toss on some Parmesan cheese and green onions, you’ll be licking your fork clean! I even made it look super-pretty to give my Hubby a tasty and attractive dinner to come home to! See, it’s so pretty to serve up! For my semi-picky kiddos, I left out the green onions to avoid the complaining. For me, I added EXTRA Parmesan. Super easy to switch it up to fit everyone’s tastes! Cook the pasta according to the package directions. Put on plate and top with the warmed shredded chicken. Pour BBQ Sauce over top, then sprinkle with the green onions, Parmesan cheese and bacon bits. Serve it all pretty, or mix it in. 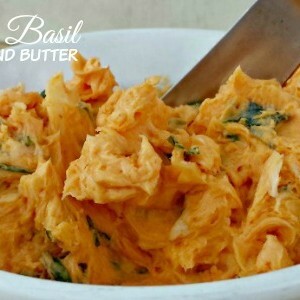 Enjoy the flavorful tangy-ness! 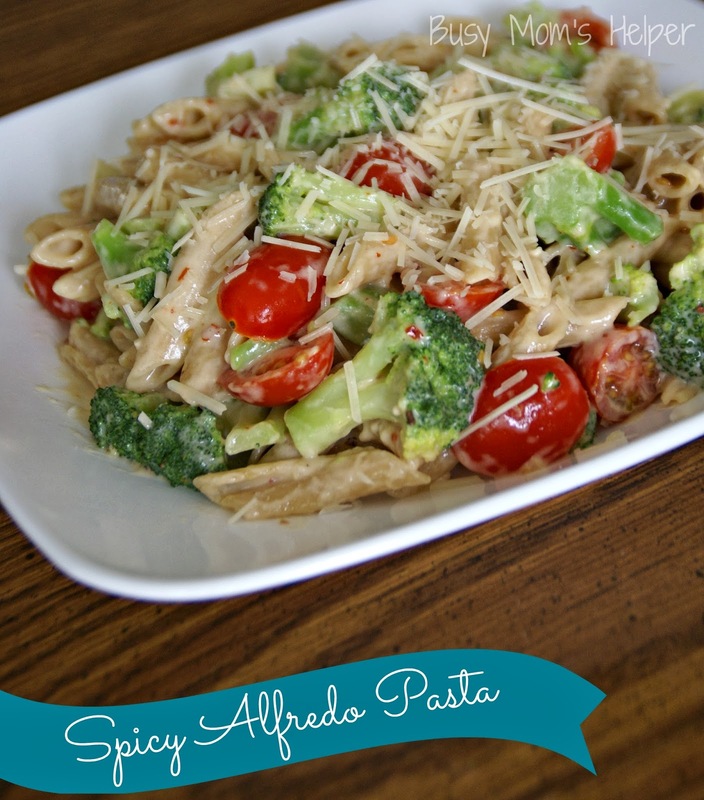 Notes: You can also switch it up a bit and add things such as olives, tomatoes, diced onions, even a touch of cream cheese for a little switch in flavoring! You know those meals that you decide to just ‘wing it’, then as you cook the smell has you totally drooling? Then you take that first bite and it doesn’t disappoint? Yup, that’s this Garlic Pesto Chicken with Penne in Tomato Cream Sauce! Oh. My. Gosh! I can honestly say this is on my FAVORITES list, for sure! The chicken is super moist, and full of marinated flavor. 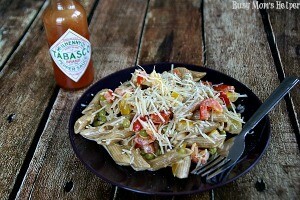 The sauce helps accent everything, and it all comes together in a delicious, almost-addictive meal. LOVE IT! 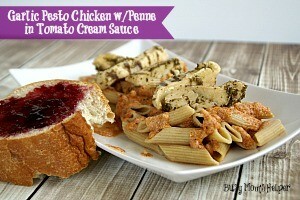 The sauce is also perfect for dipping bread or rolls, so don’t hesitate to serve those alongside this Garlic Pesto Chicken with Penne in Tomato Cream Sauce! Don’t be intimidated by this: the recipe may seem long, but I simply broke it down to VERY simple instructions. 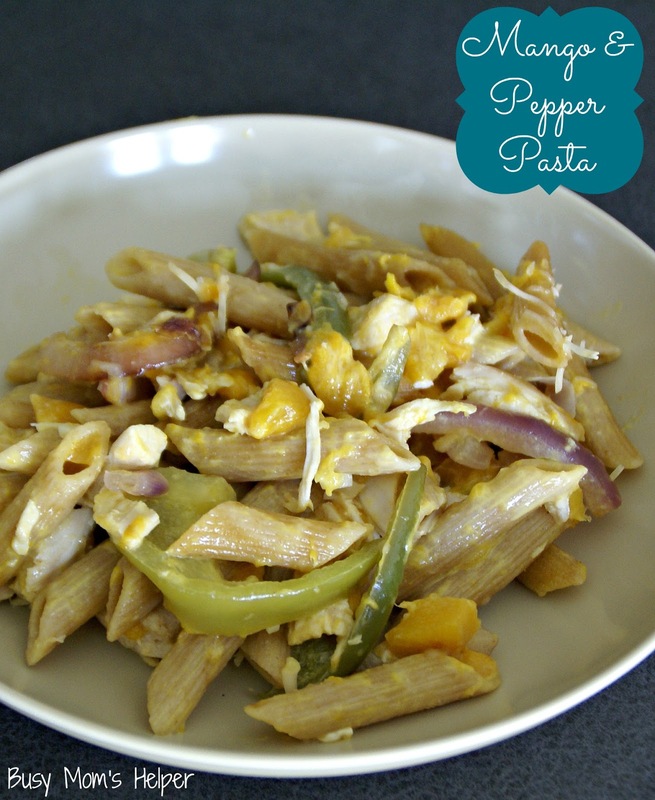 Read on through to see that this amazing dish is ridiculously easy to make! Place Chicken in a ziploc bag. Combine the other ingredients well, then add to bag. Allow chicken to marinate at least 1 hour, or overnight in the fridge. When starting to prepare the pasta and tomato cream sauce, place the chicken AND marinade in a large WOK or skillet. Cook until chicken is done. In a large skillet, heat the olive oil and garlic until bubbly, about 2 minutes. Add the Chicken Broth and cook over medium-high heat about 15 minutes, or until it has reduced almost half. Add the remaining ingredients until well-combined and heated through. 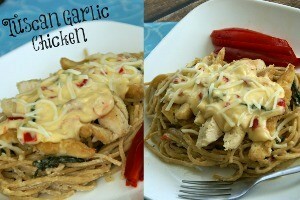 Place warm pasta on plate, cover with sauce, then top with marinated chicken. Enjoy! 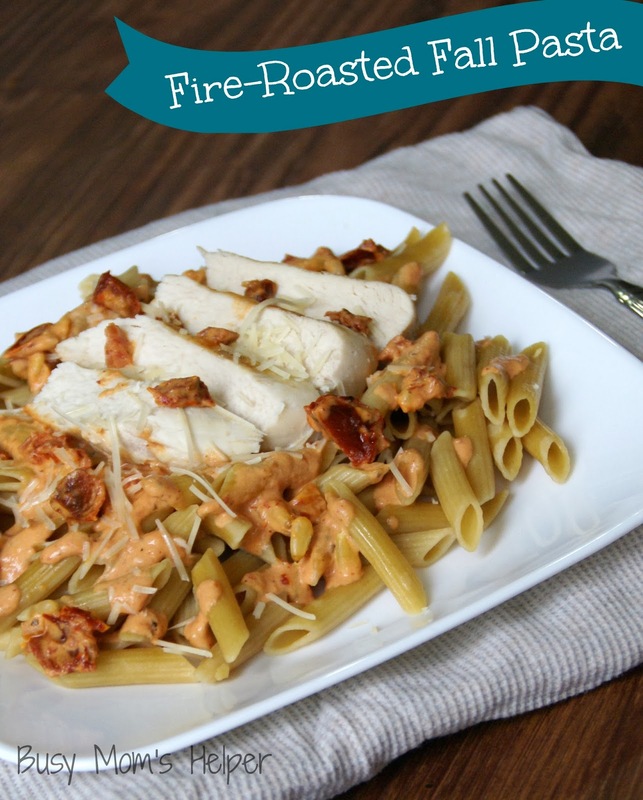 *I used pre-cooked, frozen diced chicken breast, and it turned out FABULOUS! I just marinated it in the fridge frozen for two hours, then cooked until done! Do you like balsamic vinegar? Like the taste of it? I do, like, a LOT! It’s just so….KAPOW with flavor, ya know? So when I go to Olive Garden (which hasn’t been in well over a year, but still), I love to order their Steak Gorgonzola with Balsamic Glaze. Yum-o! This is a copy-cat of that, and although it’s been quite awhile since I’ve had the true version to really compare, this was absolutely DELISH, and just how I remembered it. Okay, I may be drooling again! Oh…and it was super EASY, which I wasn’t expected. BONUS! Notes: Read the entire directions, as some of this can be done simultaneously so it can all be served fresh and warm/hot! 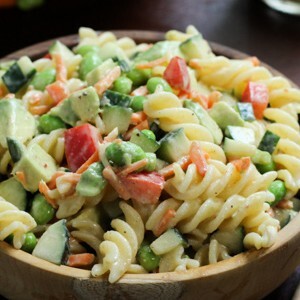 In a bowl, mix the Italian Dressing, Rosemary, and Lemon Juice. Use this to marinate the steak for at least 30 minutes, preferably an hour. Cook the steak with the marinade in a skillet over medium-high heat until cooked through. Cook the pasta according to package directions. Then mix with the Alfredo Sauce, Green Onion, and Gorgonzola. Toss with the Spinach. In a saucepan, mix the Balsamic Vinegar and Brown Sugar, stirring frequently. 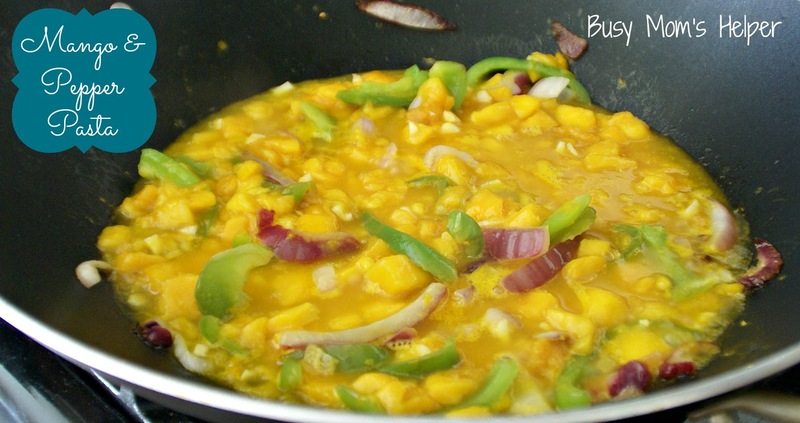 Bring to a boil, then simmer about 20 minutes. 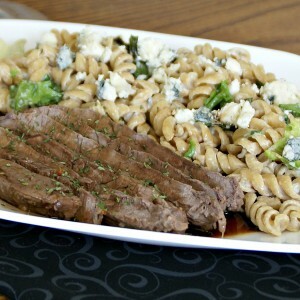 Pour glaze over steak, and serve along side the pasta. Top either/both of the dishes with more crumbled Gorgonzola, Sundried Tomatoes and/or Parsley, if desired. Okay all my fellow foodies, this may the list you’ve been waiting for – the 2013 Best of Busy Mom’s Helper Recipes! You clicked on, repinned, and viewed these recipes more than all the others, so they must be AMAZING! Have I let on how ‘geeky’ my family is? I mean, on here my kids (including Hubby) all go by our superhero names: Flash, Wonder Woman, Batman, Superman, and Green Lantern…..so that should be a pretty good clue. However, my hubby pointed out that I’ve reached a top level of Nerd when we go to a movie and a superhero-type (Avengers, Spiderman, etc.) trailer comes on, and I giggle excitedly like a little school girl. Ya, I’m a nerd. That being said, I’m DYING now that I’ve seen the 2nd Hobbit movie. I WANT TO KNOW WHAT HAPPENS!!! And I can’t just go read the book, because many have pointed out there’s characters and events in the movie that aren’t in the book at all – so if I read it, I’ll just be confused. ARGH!!! Anywho….I hope you’re all having a fun and relaxing (can ‘motherhood’ and ‘relaxing’ be used in the same sentence without ‘isn’t’?) holiday season! 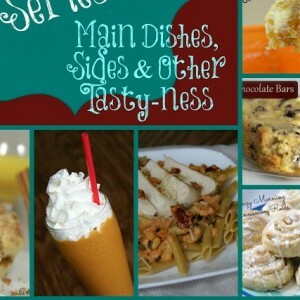 Here’s the 3rd installment in the Busy Mom’s Helper Best of 2013 Series: Main Dishes, Sides & Other Tasty-ness!!! 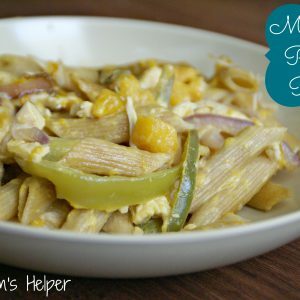 What do YOU consider the Best of Busy Mom’s Helper Recipes?